At the end of January, Martin Garrix previewed “the first idea” of a new song he had shown his fans through Instagram Live. It now appears as though it’s finally come together, and may be slated for a release in the near future. 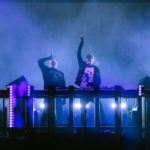 Fans keenly observed that the ID featured in the recap video of Garrix’s extravagant Ultra performance happened to carry the same chord arrangement as the clip he’d shared with fans earlier in the year and thus could be the finished product. Since its original teaser, the Dutch producer has added considerably stronger elements to make it perfect for the main stage. Garrix also debuted a variety of other IDs in his Ultra set, which you can listen to here.